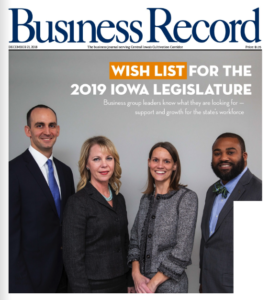 In December, Harkin Institute Executive Director Joseph Jones participated in a panel discussion about expectations for the upcoming Iowa legislative session. The discussion was curated in a cover story for the Business Record that ran on December 28. Read Joseph’s remarks and the full article. Address: 2429 University Avenue, Des Moines, IA 50311 Phone: 515-271-3623 Fax Number: 515-271-3631 Email: harkininstitute@drake.edu Office Hours: Monday to Friday 9 a.m. to 4 p.m.